Before delving into concrete action points, let’s look at some basic definitions to set the context. A LEAD is a company or person that might be interested in your products or services. A MARKETING-QUALIFIED LEAD (MQL) is a lead judged more likely to become a customer compared to other leads, often based on lead intelligence. A SALES-QUALIFIED LEAD (SQL) is the decision from sales, after a series of interactions, that an opportunity with revenue value and a time frame exists. 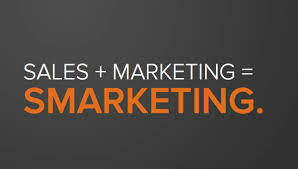 When a lead becomes a marketing-qualified lead, it can be handed over from Marketing to Sales. At this point there is sufficient engagement to warrant Sales making contact. When Sales reaches out to the client, the qualifying process continues. But this time it’s not about judging customer engagement or interest. It’s about something more tangible—asking the right questions to determine if there’s an opportunity for doing business within a certain time frame. Put differently, sales must confirm whether the MQL deserves to be converted into an opportunity that enters your pipeline. How does this help you take practical and concrete actions towards Smarketing excellence? Your first job is to sit down and document what constitutes an MQL and an SQL for your organization. Start with the MQL. How do you define what constitutes “sufficient customer engagement”? How do you determine which leads are likely to become customers? Write down your criteria and make sure it is agreed upon by Sales and Marketing. Don’t worry about finding the perfect definition right off the bat; instead, go with something that works for you. For leads coming in via inbound marketing campaigns, you might want to use a certain lead score (the sum of active online interactions) and direct contact requests (a specific type of action) as the tipping point between leads and marketing-qualified leads. Second, do the same exercise for your sales-qualified leads. Write down the questions sales must ask, and answer, to address certain qualifying criteria before converting the MQL to an SQL that enters your pipeline. Again, the most important thing is to find a definition that’s easy to understand, easy to apply and that works for your organization. For example, you might want to use the old and trusted BANT methodology to ask questions that help determine if there is budget, authority, need and time frame. Or you can use fact-oriented criteria—perhaps Sales Qualified Leads must be in a certain geographic area, have a set minimum number of employees and a minimum level of annual revenue in order to enter the pipeline. Having these criteria in place will make a big difference in the long run: since Sales spend 65% more time on the deals they lose than those they win, having a solid sales qualification process is crucial for Smarketing excellence. What is the most effective way for Marketing to hand over MQLs to Sales without things falling through the cracks? How do we ensure that Sales follows up on all MQLs in a consistent manner? How do we ensure all sales reps obtain the answers to our documented qualifying questions before spending time, money and resources on an opportunity? If you can, use the integrations available between your sales and marketing platforms to automate and reinforce your process as much as possible. If this isn’t possible right now, work with your teams to determine the best solution, and begin implementing it. Join us at the next A2HUG Event to learn more about aligning sales and marketing!